A small plane has crashed in central Germany, killing two women and a boy. 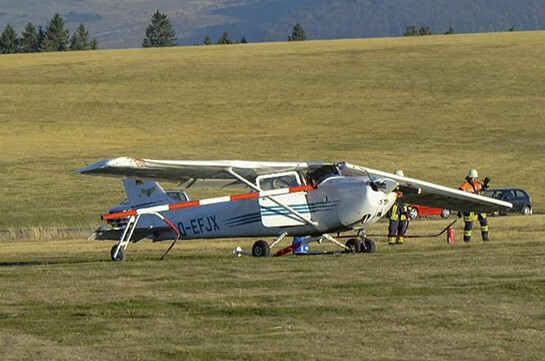 The single-engine Cessna hit a group of people clustered by an airfield on Wasserkuppe mountain near the town of Fulda in Hesse state on Sunday. The plane was trying to gain height after a failed landing and crashed through an airport fence onto a road at about 15:45 (13:45 GMT). A police statement said five people were injured, including all four on board the plane. Police are still working to identify the three victims, the statement said, although local media report the boy could have been as young as 10. The 56-year-old pilot and three passengers were taken to hospital with slight injuries, and an eyewitness suffered severe shock. The weather was reportedly fair at the time, and the cause of the crash is not yet known. Police are investigating. Emergency services are at the scene, which has been cordoned off. Hesse state prime minister Volker Bouffier and interior minister Peter Beuth said they were "deeply affected" by the crash on the state chancellery Twitter page, and thanked the emergency services for their commitment. The aircraft is reported to have been privately owned. Wasserkuppe mountain is the highest peak in the Rhön Mountains and is popular among fliers of light aircraft and gliders.